I’m not sure how we got here already, but Lulu turned one a few weeks ago. My little baby isn’t really a little baby anymore. Naturally we had to have a big celebration for reaching this milestone and because Lulu has a lot of fans, our big celebration really was big. 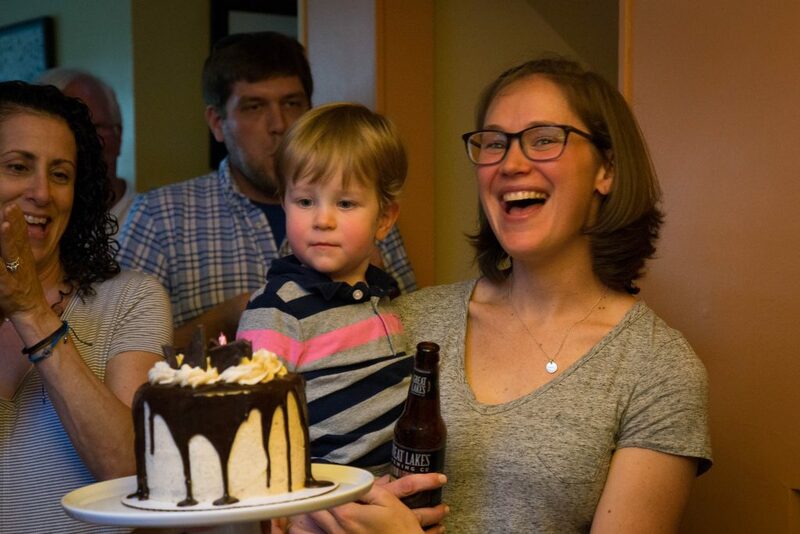 Nearly 50 people showed up to celebrate Lulu’s first birthday and it was a total blast. 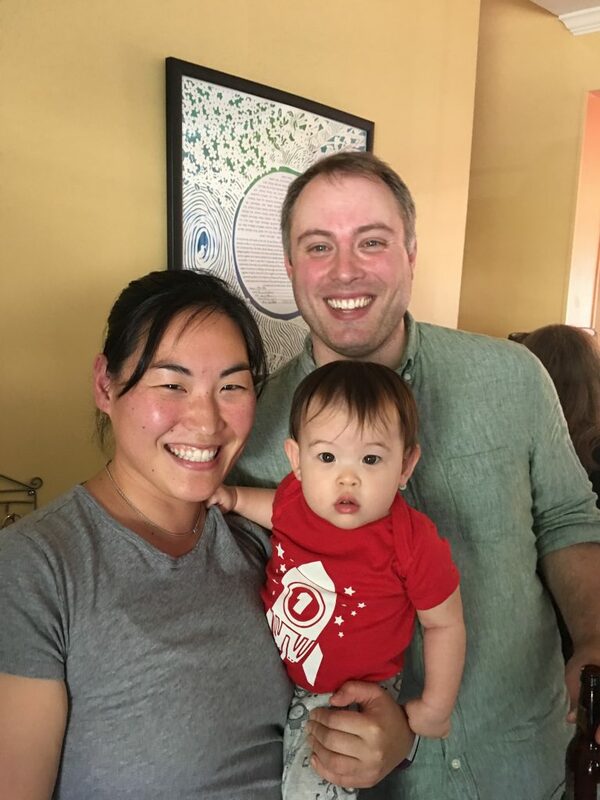 We served dumplings for our little dumpling, which meant we had potato knishes to represent her Jewish side and three kinds of Asian dumplings – pork and scallion, Asian chicken, and tofu, cabbage and kimchi dumplings. We rounded out the menu with bulgogi, rice, homemade kimchi, and Korean spinach. Andrew and I split cooking duties and the food was a big hit! 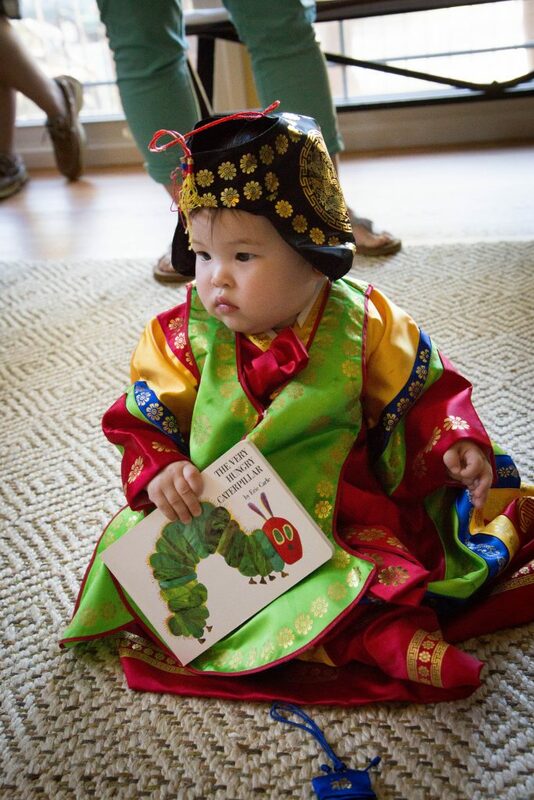 In the Korean tradition, first birthdays are a huge deal. Everyone made it through the first year, hurrah! There’s usually a table piled high with food with lots of symbolism, but the main event is the doljabi. 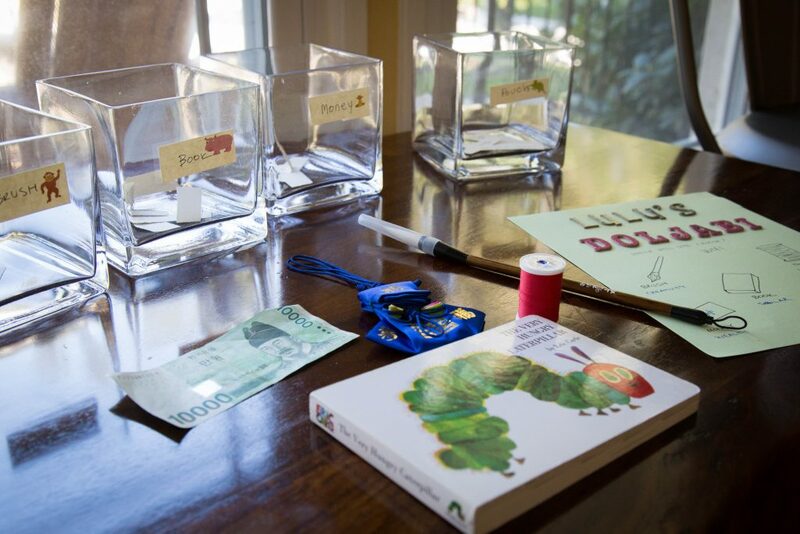 The doljabi is where a number of items are placed in front of the baby and she gets to pick one. Whatever she picks is supposed to predict her future. For Lulu’s doljabi, we put out a book (smarts), paintbrush (creativity), money (wealth), thread (long life), and a pouch (good fortune). We had people make guesses on what she would pick and the winners got a prize. 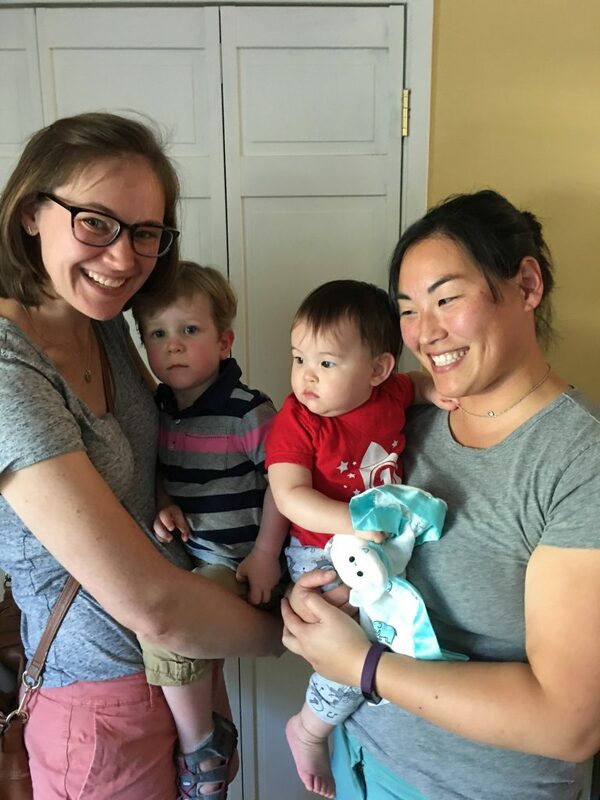 Our favorite weekend dinner pals, Jen, Evan, and Lulu’s bestie (maybe?) Owen were there. Don’t they look so happy to be with each other? 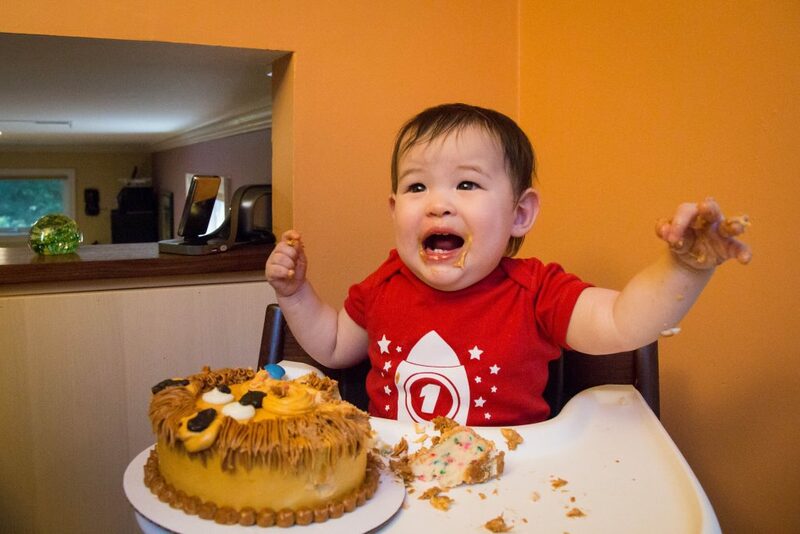 When it came time for Lulu’s cake, I think she was mostly just overwhelmed. 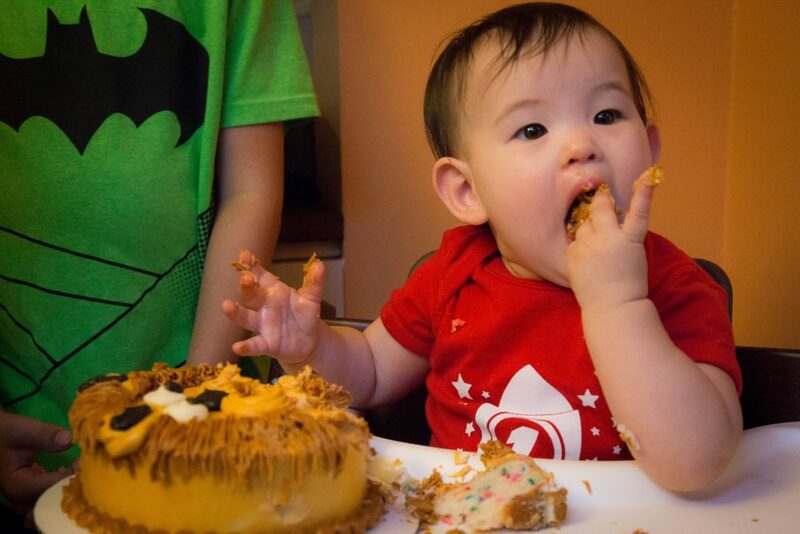 She tentatively touched the cake before finally poking it and taking a few tastes. I think she only ate icing though and left the actual cake on the tray. 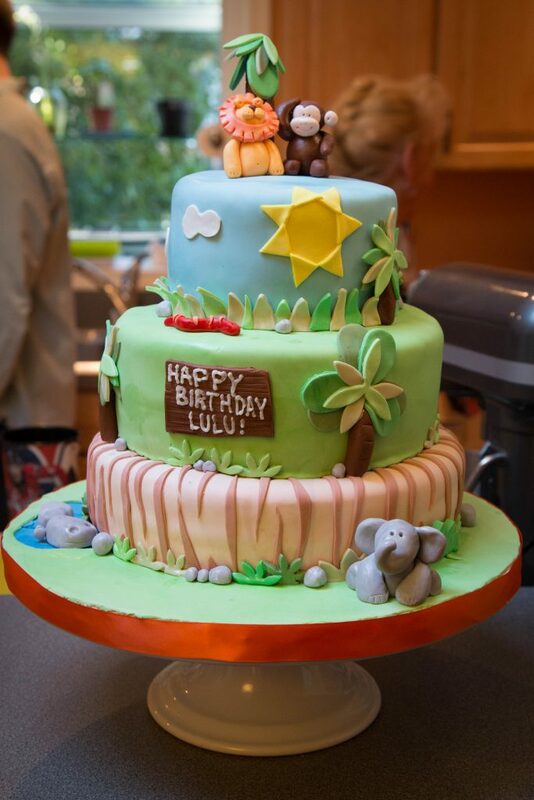 Her cakes had a jungle theme because Lulu loves the realistic-looking plastic animals. She has a giraffe named Nadine, an elephant named Edna, and tiger named Cynthia who she plays with in the mornings. We tried to give her some of the more cartoon-y figures, but she really prefers the more realistic ones. Her big cake was apple-spiced with a vanilla-chai buttercream and funfetti (the happiest cake!) 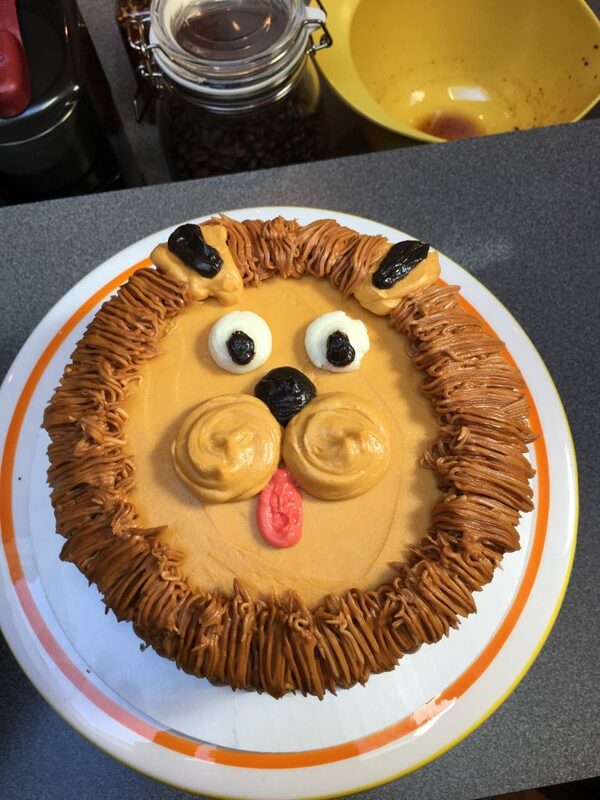 with vanilla buttercream. The cake is decorated with fondant and the figures are hand-sculpted, also out of fondant. Lulu’s smash cake is funfetti cake with vanilla buttercream piped decorations. 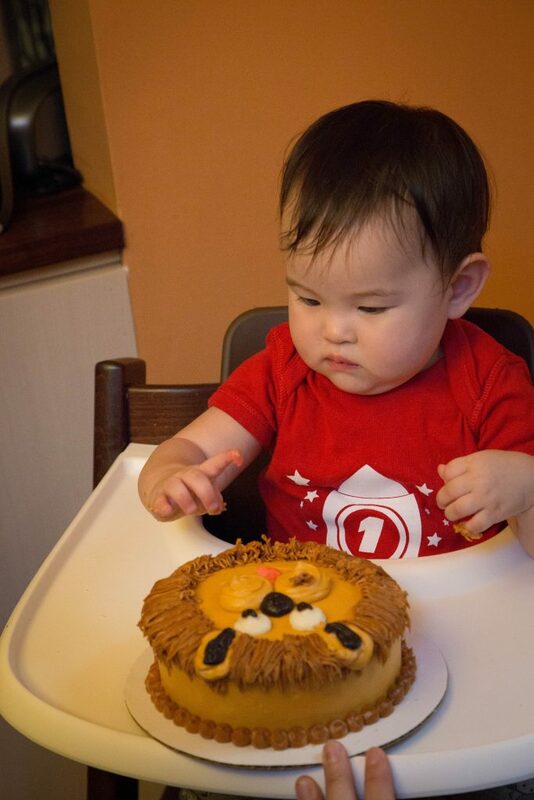 My friend wondered if her hesitation in eating the cake was due to the fact that it had face? Maybe? 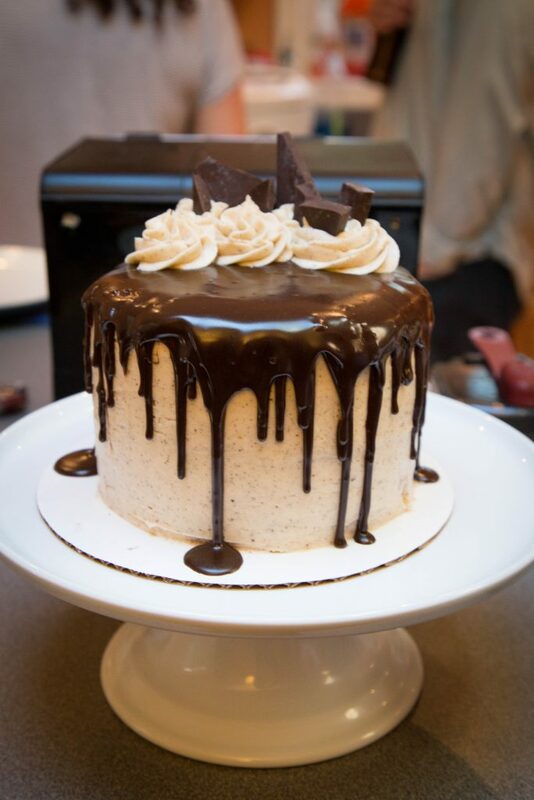 Jen’s cake was a cardamom coffee cake with a coffee-chai buttercream and a chocolate ganache drip. I love the look of drip cakes and I feel like they actually aren’t that hard to do and look so elegant. 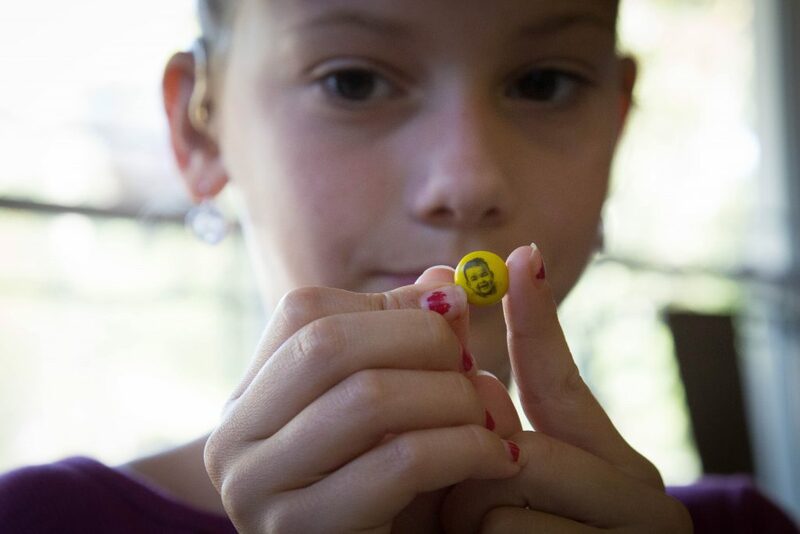 Other fun treats were M&M’s with Lulu’s face on them, courtesy of grandma. 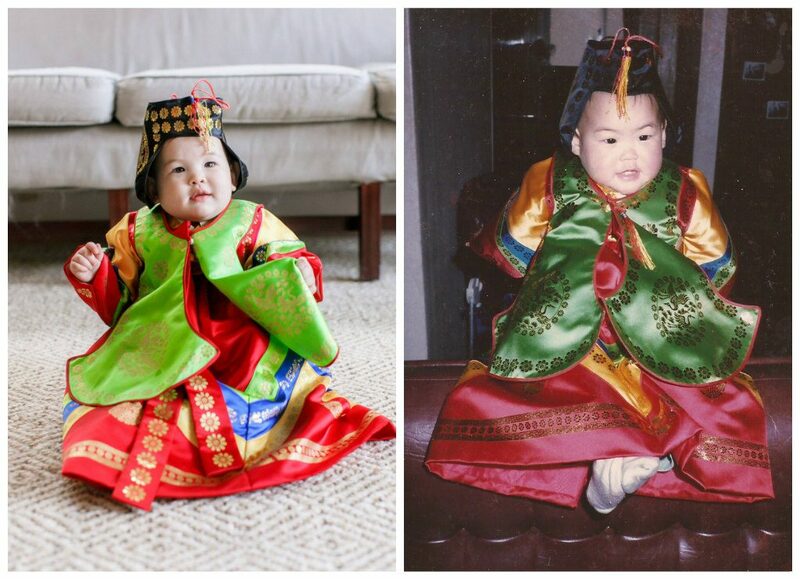 Also, Lulu’s hanbok is actually mine from my first birthday. We stilled lived in Korea and I had a big traditional Korean birthday party. 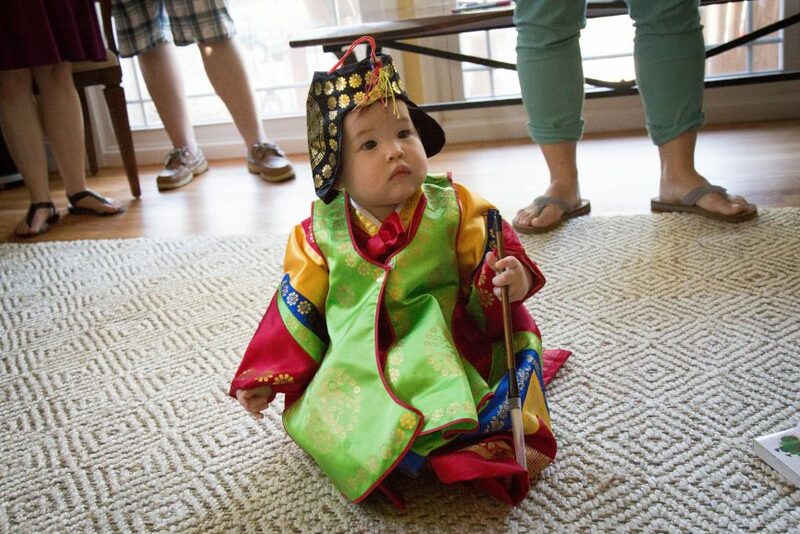 My mother kept the hanbok and we pulled it out of the closet for Lulu’s birthday. Considering it’s over thirty years old, I think it looks pretty good! Picture on the left: Dani Leigh Photography, picture on the right: my mom? The picture on the left is Lulu and the picture on the right is me. All-in-all, it was a great afternoon. It was so fun to have so many of our friends and family over to celebrate with us and Lulu was a total champ. Each day with Lulu gets more and more fun and she grows and explores and learns. The past year went by in a flash, so I’m trying to savor all these moments and she toddles right into her second year. Get neswbie gardening suggestions, concepts & recommendation.